A category defined as 148cms, for ponies exceeding 138cms, but not exceeding 148cms in height. This rider would be the eldest of the Pony Riders being able to compete up to the end of the year in which they reach 16! A category defined as 138cms, for ponies exceeding 128cms but not exceeding 138cms in height, to be ridden by children up to the end of the year in which they reach the age of 14 years! A category defined as 128cms, for ponies not exceeding 128cms in height, to be ridden by children up to the end of the year in which they reach the age of 12 years! 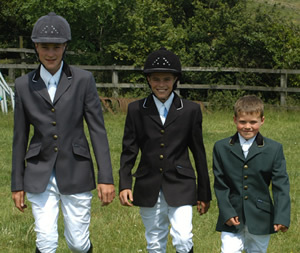 Hold your mouse over the child which best reflects the size/age of child you are interested in to see the size of pony they can ride in competition registered National Showjumping competitions held all over Ireland!